If youre unhappy with your life, you can continue to tread the path youre on. Or you can decide to create the future you long for. We each have two futures: a “default” future, and a “created” future. If you’re struggling to move your business forward, but everything you do seems to bring you back to the same place—month after month, year after year—you’re setting yourself up to live your default future. Imagine if nothing changed next year or the year after. Now project that out five or ten years. What does that future look like? That’s your default future. Is that okay with you? Perhaps you’re terrified to invest money, time and energy in trying to change your path because of the risk that it might not work out. Hiring an assistant, working with a coach, changing your business affiliations—these things could result in a steep expenditure (of money, time or energy) with nothing to show for it down the line. But if you don’t overcome the fears that are keeping you from changing, you are almost certain to live out your default future. The future you could be living is your “created” one. So ask yourself: What would you want to create? What resources would you need to create it? How would you find the money, time and energy to experiment with creating what you want? 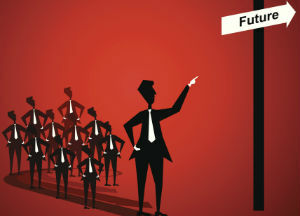 If you’re hoped-for future is one in which you’re earning a comfortable six-figure income, have left your money worries behind, have eliminated stress, have made yourself healthier or have found more time to spend with your family, you need to do something different—something you’ve calculated might actually get you to the future you want. And if that plan fails, you need to be willing to find another plan and maybe another—until you’re successfully creating the future of your dreams.